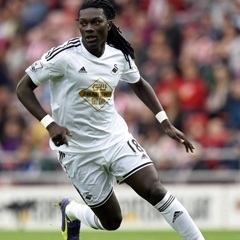 London - Swansea City striker Bafetimbi Gomis returned to training on Wednesday, a week after collapsing during a Premier League game at Tottenham Hotspur. Gomis, 29, suffers from a vasovagal condition, which causes low blood pressure, and fainted in the early stages of Swansea's 3-2 defeat at White Hart Lane before being stretchered off and taken to hospital for observation. But the France international took part in training on Wednesday as his team-mates returned to Swansea's training centre following a six-day break and is in contention to face Liverpool on Monday. "Bafe is back in Swansea and trained today (Wednesday)," a Swansea spokesman has said. After the game, Gomis took to social media to reassure supporters, writing on Twitter that he felt "fine" and blaming the incident on "stress and fatigue" due to his father's ill health.